Birthday parties are available most weekdays. Please contact us with your preferred time and we’ll get you set up! 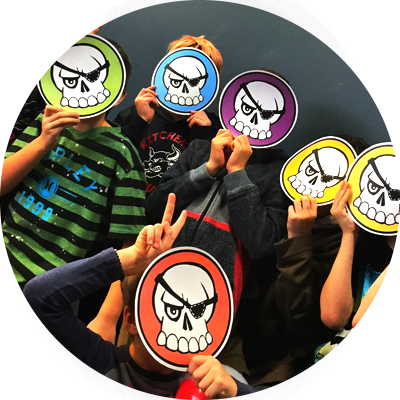 All Hero Parties come with a Heroes of the Land adventure for each player, a Dedicated Games Master during your game and access to our meeting space for the duration of your celebration. Please tell your guests to arrive at your party’s start time. As the host, you are invited to arrive 15 minutes earlier to set up the space and await their arrival. After your game(s) you will continue to have access to our meeting room where you’ll be able to celebrate as a group. Food and beverages are not provided by Complex Rooms, but there are fantastic dining options in the area for pickup or delivery to our address; we can provide menus for you! Our meeting space is suitable for the heroes and a limited number of additional guests. When your party is over we ask that your guests be picked up at the allotted time. We’ll help you with clean up and, don’t worry, we’ll take care of the recycling! If you have any questions or concerns about the above points please let us know! Please note: We ask that you bring entertainment for your guests during the time they’re not participating in an adventure. Unfortunately our facility is not suitable for active play so, for your safety and the safety of our other guests, we do not allow running and active play in our hallways. If you would like suggestions on alternate activities please let us know!